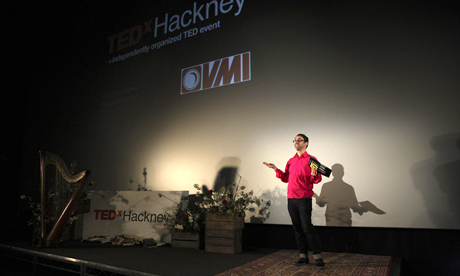 TEDx Hackney’s ‘Happiness’ event took place at the Hackney Picturehouse on Mare Street. The locally-organised event featured talks, live music and short films on the subject of happiness, which TEDx Hackney hope will inspire and inform attendees. Neuroscientist Tali Sharot explained how an ‘optimism bias’ leads people to think their futures will be brighter than they can rationally expect, while Dr David Hamilton discussed how being generous might be good for your health. Other speakers on the day (Saturday 14 April) included Steve Wheen, the ‘pothole gardener’, who talked about creating “holes of happiness” across the city, and Iva Gormley, founder of The Good Gym, on how exercise can be used for “social good”. TED is a world famous non-profit organisation interested in ‘Ideas Worth Spreading’, and holds talks and conferences on a range of subjects. Its TEDx programme allows independent events to be produced using the TED brand and following the structure of a TED event. Tickets for Happiness were sold out in two hours, with 300 people waiting after the initial sale. There were queues of people hoping to attend as late as the night before the event. TEDx Hackney’s biggest project so far, Happiness also featured a video talk by Ron Gutman on ‘the hidden power of smiling’, and musical performances by Aine O’Dwyer (harp), Daniel Waples (hang), and the London Bulgarian Choir. TEDx Hackney has small salons planned for later in the year. For more information go to TEDx Hackney.